Let the good times roll in Worcester! Lack of inventory is pushing the seller's market up, and prices have been moving up quickly, as buyers charge in to one of the cheaper markets in the area. Sometimes, things aren't complicated. 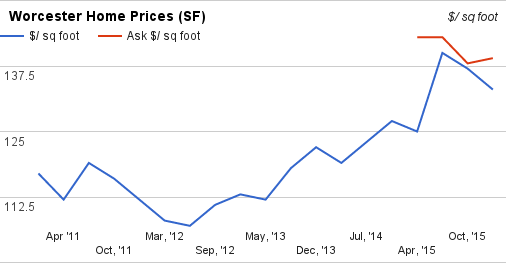 The prices paid chart - and rising optimism of sellers - is clear to see in Central Mass biggest market. What should active home buyers do in Worcester ? Find Your Next Home or Check out the Competition! Worcester home sales report, as usual, provides lots of data, a bit of a puzzle, and a warning to home buyers. but will reverse this spring.